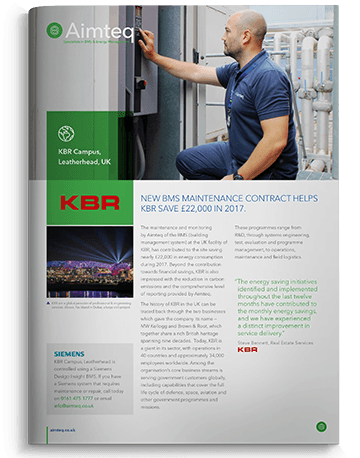 We’re one of the UK’s largest BMS systems integration businesses, with offices in London, Cirencester and Stockport providing installation, maintenance and bureau monitoring services for BEMS and BMS systems across the country. In recent years, our team has grown to in excess of 100 staff across the three offices, and a turnover of circa £13 million per year. As we’ve expanded, our technology portfolio has grown to include market-leading hardware and software from Siemens, Tridium, WEMS and Schneider Electric. Using these market-leading technologies, our building install portfolio now stands 5,500+ installs across the UK and into Europe, where we work with some of the world’s best known businesses and brands to manage their buildings and energy effectively. Our engineers play a front-facing role, representing the company on customer premises and delivering ‘5 star’ customer service. As standard, you will ensure that the needs and expectations of our customers are met on every occasion, and that they receive a positive experience from Aimteq. With a clear focus on customer delivery, you will perform installation and commissioning tasks at customer sites to ensure that the required building control systems are properly installed and commissioned in line with the agreed specifications for the project. Thus contributing to company profitability and customer satisfaction. Our engineers operate in a project delivery environment and need to be highly self-sufficient and self-motivated. You will operate in accordance with our core values; strive to exceed standards and targets, and work both flexibly and smartly to deliver a first-class customer service. You will be equipped with a laptop, software and hand-held tools, uniform, test meters and communication devices to enable your installation and commissioning duties. Personal pride and care will always be taken with equipment, ensuring its safe use and storage. Knowledge of energy efficiency processes and practices, the energy market, and our business, products and services. Operate in the field ensuring safe working practices are followed at all times. Ensure the highest safety and quality standards are met and that personal and customer safety is maintained at all times, paying attention to detail. Ensure all work adheres to the company safety rules/statutory regulations/customer requirements. Comply with all company policies, processes and procedures. Install systems to the standards dictated by the contract and compliant with the appropriate Aimteq company engineering quality standards. Positively engage customers on the features and benefits of their control systems, ensuring its functionality are understood and identify and recommend the products and services that may benefit the customer and meet business requirements. Deal positively with customer complaints, quickly resolving these in the most cost-effective way whilst also ensuring that high levels of customer satisfaction are maintained. Provide relevant energy efficiency advice to the customer. Be fully aware of the environmental impact of energy consumption on the environment and able to articulate to the customer the impact and benefits of increasing energy efficiency and reducing energy consumption. Establish a good working relationship with all customers and differentiate our business through the delivery of exceptional customer service by listening and responding to customer needs and concerns and taking ownership of the situation. Ensure expectations have been met and the customer is fully satisfied with the work prior to departure. Works with other branches, company or external service providers or vendors to resolve problems. Be flexible and willing to work additional hours to meet project/support deadlines or as needs dictate. Ensure all tools and equipment are maintained and kept in good working order, ensuring constant availability to meet customers’ needs. Manage waste in a responsible and timely manner in accordance with relevant legislation and procedures. Refresh knowledge and skill-set by attending technical and procedural updates, adopting and applying new skills and working practices to enhance safety, customer satisfaction and efficiency. Excellent communication skills along with an aptitude for recommending company products. Possesses technical skills to install, maintain and repair control systems, working to the highest safety and quality standards required by the company through attained accreditation. Adheres to the company dress code and maintains a professional appearance at all times.